In radio, as with any other branch of show business, there was a distinct class system. There were Radio Stars (no need to mention their names, you know who they were), and there were Working Actors, the anonymous legions of performers who filled in the supporting roles, made the rounds of every studio, worked for scale, and counted their pennies. And there were many more of the latter than there were of the former. And yet, many of these little-known performers became as familiar, in their own way, as the big name stars themselves. Whenever these performers stepped to the mike, someone in the room was bound to say, “Oh listen, there she is again.” That was the height of fame for a working performer in the Golden Age of Radio: “Oh listen, there she is again.” But, the work was fun, the jobs enjoyable, and many fine actors and actresses made long careers that way. One such favorite was actress Paula Winslowe. Paula Winslowe was luckier than most of her colleagues in that, halfway through her long and productive radio career, she actually got name billing in a popular series. For six years, she played Peg Riley, wife of the blundering-mean-weller Chester A. Riley. This is the role with which she is most associated today, but there was a lot more to her career than just that one character. 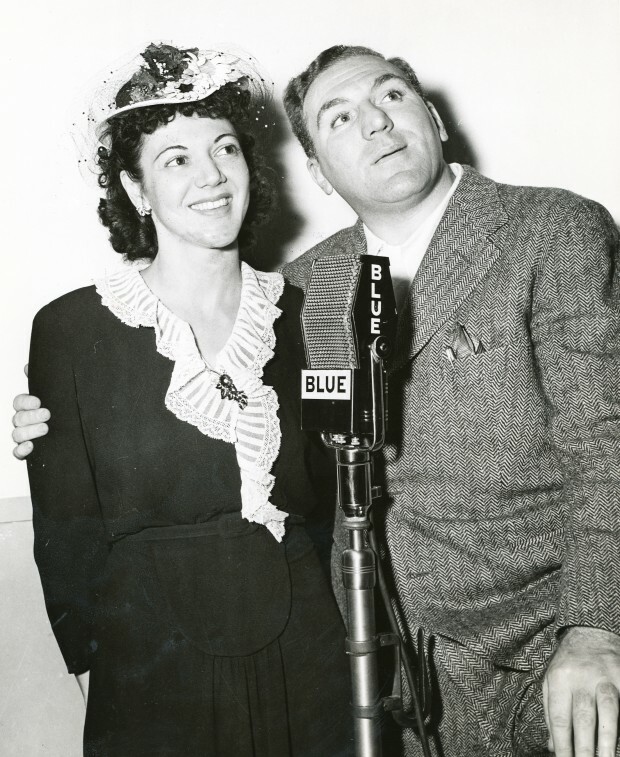 Winslowe was one of the many performers in the Radio Era who never set out to be a performer. She was born a long, long way from the footlights of Broadway, or the movie lights of Hollywood, and she didn’t dream childhood dreams of dancing on the vaudeville stage. She was an ordinary girl from a small town in North Dakota, growing up in the 1910’s and 1920’s in a prairie world little removed from the nineteenth century in its values and its mores. She married young, as was expected, to her high school sweetheart. But, then she did something unexpected: she left town. Her husband, John Sutherland, was an ambitious young movie fan, captivated from an early age by the flickers. He wanted to try his hand at making pictures himself, so he packed up his dreams and his young bride and set out for Hollywood. Sutherland didn’t make much of an impression at the big studios, but did manage to catch on making educational classroom shorts. It wasn’t exactly Cecil B. DeMille parting the Red Sea, but it beat driving a farm truck for a living. The Sutherlands arrived in California just as the world was changing forever: the talking picture revolution upended the cozy little institution of movie making like nothing else before or since. Careers were made and broken. Stars were forgotten, and new stars installed in their place. Whether an actor or actress could “talk” suddenly became a matter of vital importance — and not just talk, but talk in a way that befit their screen image. If they couldn’t…well, the studios were discovering that there were ways around that. Throughout 1928 and 1929, there were whispers that some of those lovely dulcet tones issuing from the Movietone speakers didn’t exactly belong to the throats from which they appeared to issue. Sometimes, it was rumored, they came from what were known as “voice doubles,” performers who sounded more like the stars than the stars themselves. And, it turned out that Mrs. John Sutherland had just such a voice. Working under her maiden name, Paula Winslowe picked up plenty of anonymous work in the early days of the talkies, dubbing and doubling for actresses who weren’t quite microphonic enough. She had a pleasant contralto voice, could sing a bit, and had enough acting talent to sell what she was saying. She soon found that she enjoyed this work. Voice dubbing kept her busy for a while, but scandalous articles in the fan press about stars whose voices were not really their own drove the practice into disrepute, and those jobs began to drop off. But, there was another fast-growing field in which people with acting talent and good voices might make a decent living, and Paula Winslowe soon found her way there. KHJ, the Don Lee station in Hollywood, was a nexus for radio drama in the early years of the depression. Under ambitious program director Lindsay MacHarrie, the station developed an impressive stock company of talent for its own range of dramatic features. Heard only on the West Coast, these local productions introduced many talented performers to the microphone — including Paula Winslowe, who was soon specializing in wistful heroines, vulnerable women yearning for happiness. And, in the melodramatic world of early radio drama, there was never any shortage of such roles. She soon became one of Los Angeles’ busiest microphone actresses. With the Don Lee Network serving through 1936 as the west coast outlet for CBS, Winslowe also turned up on national programs. During 1934 and 1935 she was heard on Bing Crosby’s popular Woodbury Program — appearing in dramatized commercials as, alternately, a discouraged young lady whose pitted, peeling, alligator-hide complexion kept her forever isolated from happiness, or the smooth, confident young socialite who recommended taking the Woodbury Half Face Test to other bright young ladies in her set. These parts were anonymous, but they paid better than an unsponsored program. In those days before unionization brought an honest deal to radio performers, sponsored jobs were the only way to earn decent money at the microphone. Through the mid-thirties, Winslowe grabbed as many of these jobs as she could — whether she was selling soap, soup, or gasoline didn’t much matter. She took her script, gave her pitch, and built a reputation as a solid, reliable performer. Her name wasn’t well known to the audience, but directors knew where to find her, and that’s all that counted. She became especially familiar to listeners of the famous Lux Radio Theatre, where for years she played second leads and key supporting roles opposite most of the big names of the time, while selling her share of soap in those ever present dramatized commercials. Winslowe continued to do movie dubbing where opportunities arose — most famously in 1937, when the sudden death of slinky legend Jean Harlow left an unfortunate hole in her final unfinished film Saratoga. The use of a body double to fill the visual gap, and Paula Winslowe to provide the appropriately sultry voice, allowed this picture to reach the screen. Winslowe also made herself known in the expanding world of animation, where she became a regular voice actress in the films of Walt Disney. Her best known work for that studio was as the kindly voice of Bambi’s doomed mother. Paula Winslowe had been a radio professional for fourteen years when she was cast in her most famous role as perhaps radio’s definitive depiction of a working-class housewife. Margaret “Peg” Riley sounded like a woman who’d seen a lot over the course of her marriage, an unpretentious Brooklyn girl probably not too far removed from the factory floor herself, who accompanied her riveter husband and their two teenage children to California when a well-paying war job beckoned. It was a path followed by many real-life working families, and the Rileys made the best of it, settling into one of the many slapped-together wartime housing developments and building new lives. Chester A. Riley was radio’s original dopey dad, but his wife’s patient, common-sense approach always got matters back on track before the half-hour was up. Winslowe’s voice was perfect for the role, combining exasperation and eternal patience in equal amounts. Peg wasn’t a shrew or a nag, nor was she a “dizzy dame” or a “dumb Dora.” She didn’t wear the pants in the family, but she made sure Riley knew who ironed them. Winslowe played Peg for The Life of Riley’s full run on radio, but when the program was adapted for a feature film, she lost out to Rosemary DeCamp (who was, perhaps, more photogenic…possibly even too photogenic for the part). DeCamp was a fine actress, but she wasn’t Peg Riley — even though she was chosen to play the role again opposite nightclub comic Jackie Gleason when a short-lived television adaptation of the series began in the fall of 1949. That series flopped, but a new version came to television in 1953, with William Bendix in the lead, and enjoyed a healthy five year run. Unfortunately, that run did not include Paula Winslowe, who was passed over yet again. This time, it was Marjorie Reynolds who won the role…and happened to be seven years her junior, with magazine-cover looks, and an established film career besides. But, Paula Winslowe kept working in radio as long as there was radio to work in. She was a favorite actress of radio Renaissance-man Elliot Lewis, and turned up again and again in his first-rate productions of the early and middle 1950’s. When Lewis made a late-in-life return to the medium he loved in the late 1970’s with Sears Radio Theatre, Paula Winslowe was a member of his repertory company. Well into her sixties by then, and a grandmother many times over, her voice hadn’t lost its versatility. From the start of her radio career in 1930 to its conclusion in 1979, Paula Winslowe was always A Working Actress. Copyright 2013 Elizabeth McLeod and RSPT LLC. All rights reserved.